The Flourish Thinlits dies and matching stamp set are so pretty for Elegant cards. And like many of the awesome new Stampin’ Up! products, you can get them as a bundle! Love that…savings for two things I was going to buy anyways. On this card I cut out several of the pieces using purples and blues and pieced them all together in a pretty and simply card. I got the idea from a demonstrator in my group, Laura Seki, of Hamilton who did a black and white card (it was stunning!). 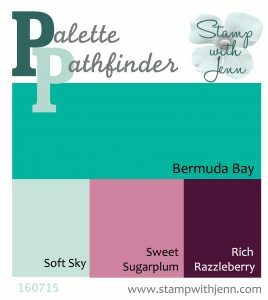 But I’m having a love affair with this colour combination these days: Soft Sky (or Pool Party), Sweet Sugarplum, Bermuda Bay and Rich Razzleberry. Feel free to save this combination (it is also on my Pinterest board HERE). If you’d like the full instructions for this elegant card (and nine other adorable cards), be sure to use this month’s hostess code (for July 2016: JT749E3J) when you are shopping online and I’ll send you my Project Sheets at the end of the month (read more about my Project Sheets Program here). I’ll also have another card in this group using the Flourish Thinlits.